A check is the basic unit of a test. As the name suggests, it checks whether some condition is true. A test case is a group of checks that form one conceptual unit. If any check within the case fails, the entire case fails. A test suite is a group of test cases and test suites that has a name. Checks are the basic building block of RackUnit. A check checks some condition and always evaluates to (void). If the condition doesn’t hold, the check will report the failure using the current check-info stack (see current-check-handler for customizing how failures are handled). Although checks are implemented as macros, which is necessary to grab source locations (see Custom Checks), they are conceptually functions (with the exception of check-match below). This means, for instance, checks always evaluate their arguments. You can use a check as a first class function, though this will affect the source location that the check grabs. The following are the basic checks RackUnit provides. You can create your own checks using define-check. (check-eq? v1 v2 [message]) → void? (check-not-eq? v1 v2 [message]) → void? (check-eqv? v1 v2 [message]) → void? (check-not-eqv? v1 v2 [message]) → void? (check-equal? v1 v2 [message]) → void? (check-not-equal? v1 v2 [message]) → void? Checks that v1 is equal (or not equal) to v2, using eq?, eqv?, or equal?, respectively. The optional message is included in the output if the check fails. message: "allocated data not eq?" (check-pred pred v [message]) → void? Checks that pred returns a value that is not #f when applied to v. The optional message is included in the output if the check fails. The value returned by a successful check is the value returned by pred. (check-= v1 v2 epsilon [message]) → void? Checks that v1 and v2 are numbers within epsilon of one another. The optional message is included in the output if the check fails. (check-within v1 v2 epsilon [message]) → void? Checks that v1 and v2 are equal? to each other, while allowing numbers inside of them to be different by at most epsilon from one another. If (equal? v1 v2) would call equal? on sub-pieces that are numbers, then those numbers are considered "good enough" if they’re within epsilon. Added in version 1.10 of package rackunit-lib. (check-true v [message]) → void? (check-false v [message]) → void? (check-not-false v [message]) → void? Checks that v is #t, is #f, or is not #f, respectively. The optional message is included in the output if the check fails. (check-exn exn-predicate thunk [message]) → void? Checks that thunk raises an exception and that either exn-predicate returns a true value if it is a function, or that it matches the message in the exception if exn-predicate is a regexp. In the latter case, the exception raised must be an exn:fail?. The optional message is included in the output if the check fails. A common error is to use an expression instead of a function of no arguments for thunk. Remember that checks are conceptually functions. The following example is a common mistake. The call to error is not within a lambda, so it bypasses check-exn entirely. ; Forgot to wrap the expression in a thunk. Don't do this! (check-not-exn thunk [message]) → void? Checks that thunk does not raise any exceptions. The optional message is included in the output if the check fails. exception-message: "car: contract violation\n expected: pair?\n given: '()"
message: "don't divide by 0"
exception-message: "/: division by zero"
(check-regexp-match regexp string) → void? Checks that regexp matches the string. (check op v1 v2 [message]) → void? The most generic check. Succeeds if op applied to v1 and v2 is not #f, otherwise raises an exception of type exn:test:check. The optional message is included in the output if the check fails. This check fails unconditionally. Good for creating test stubs that you intend to fill out later. The optional message is included in the output. When a check fails, it may add information about the failure to RackUnit’s check-info stack. Additional information can be stored by using the with-check-info* function, and the with-check-info macro. A check-info structure stores information associated with the context of the execution of a check. The value is normally written in a check failure message using write, but the rackunit library provides several special formatting wrappers that can influence how the check info value is printed. A special wrapper around a string for use as a check-info value. When displayed in a check failure message, value is displayed without quotes. Used to print messages instead of writing values. Added in version 1.2 of package rackunit-lib. A special wrapper around a list of check-infos for use as a check-info value. A check info whose value is a nested info is displayed as an indented subsequence of infos. Nested infos can be placed inside nested infos, yielding greater indentation. Added in version 1.7 of package rackunit-lib. A special wrapper around a procedure that produces a value for a check-info. When a dynamic-info is displayed in a check info stack, proc is called to determine what value to display. The value returned by proc may itself be a special formatting value such as nested-info (or even another dynamic-info), in which case that value is rendered as it would be if it had not been wrapped in dynamic-info. Added in version 1.9 of package rackunit-lib. is printed along with the usual information on an check failure. The with-check-info macro pushes the given information onto the check-info stack for the duration of the execution of the body expressions. Each name must be a quoted symbol and each val must be a value. is displayed along with the usual information on an check failure. Similar to with-check-info*, but ignores elements of info whose name (as determined by check-info-name) matches the name of an element on the current check-info stack. The error message above should include 'first-name but not 'last-name. Custom checks can be defined using define-check and its variants. To effectively use these macros it is useful to understand a few details about a check’s evaluation model. First, a check should be considered a function, even though most uses are actually macros. In particular, checks always evaluate their arguments exactly once before executing any expressions in the body of the checks. Hence if you wish to write checks that evaluate user defined code that code must be wrapped in a thunk (a function of no arguments) by the user. The predefined check-exn is an example of this type of check. Second, checks add information to the check-info stack: an internal list of check-info structures that RackUnit interprets to build error messages. The basic checks treat the stack as a source of optional arguments; if the stack is missing some information, then the check may supply a default value. For example, check-equal? adds a default source location if the check-info stack does not contain a check-info with the name 'location (see make-check-location). The define-simple-check macro constructs a check called name that takes the params and an optional message as arguments and evaluates the bodys. The check fails if the result of the last body is #f. Otherwise the check succeeds. Simple checks cannot report extra information by using with-check-info inside their body. For example, the following code defines a check check-odd? The define-binary-check macro constructs a check that tests a binary predicate. It adds the values of actual and expected to the check-info stack. The first form of define-binary-check accepts a binary predicate and tests if the predicate holds for the given values. The second form tests if the last body evaluates to a non-false value. The define-check macro is similar to define-simple-check, except the check only fails if fail-check is called in the body of the check. This allows more flexible checks, and in particular more flexible reporting options. Checks defined with define-check add the source location and source syntax at their use-site to the check-info stack, unless the stack already contains values for the keys 'location and 'expression. Changed in version 1.9 of package rackunit-lib: Documented the protocol for adding 'location and 'expression information. Raises an exn:test:check with the contents of the check-info stack. The optional message is used as the exception’s message. As programs increase in complexity the unit of testing grows beyond a single check. For example, it may be the case that if one check fails it doesn’t make sense to run another. To solve this problem compound testing forms can be used to group expressions. If any expression in a group fails (by raising an exception) the remaining expressions will not be evaluated. A test-begin form groups the exprs into a single unit. If any expr fails the following ones are not evaluated. Like a test-begin except a name is associated with the bodys. The name will be reported if the test fails. Here’s the above example rewritten to use test-case so the test can be named. True if obj is a test case, and false otherwise. (test-check name operator v1 v2) → void? (test-pred name pred v) → void? (test-eq? name v1 v2) → void? (test-eqv? name v1 v2) → void? (test-= name v1 v2 epsilon) → void? (test-true name v) → void? (test-false name v) → void? (test-not-false name v) → void? (test-exn name pred thunk) → void? (test-not-exn name thunk) → void? Test cases can themselves be grouped into test suites. A test suite can contain both test cases and test suites. Unlike a check or test case, a test suite is not immediately run. Instead use one of the functions described in User Interfaces or Programmatically Running Tests and Inspecting Results. Constructs a test suite with the given name and tests. The tests may be checks, test cases, constructed using test-begin or test-case, or other test suites. The before-thunk and after-thunk are optional thunks (functions with no argument). They are run before and after the tests are run, respectively. Unlike a check or test case, a test suite is not immediately run. Instead use one of the functions described in User Interfaces or Programmatically Running Tests and Inspecting Results. For example, here is a test suite that displays Before before any tests are run, and After when the tests have finished. (test-suite "A nested test suite"
Constructs a test suite with the given name containing the given tests. Unlike the test-suite form, the tests are represented as a list of test values. The define-test-suite form creates a test suite with the given name (converted to a string) and tests, and binds it to the same name. This form is just like define-test-suite, and in addition it provides the test suite. The before, after, and around macros allow you to specify code that is always run before, after, or around expressions in a test case. Whenever control exits the scope execute the after-expr after executing expr-1, and expr-2 ... The after-expr is executed even if control exits via an exception or other means. Whenever control enters the scope execute the before-expr before executing expr-1 expr-2 ..., and execute after-expr whenever control leaves the scope. The test below checks that the file test.dat contains the string "foo". The before action writes to this file. The after action deletes it. This somewhat curious macro evaluates the given tests in a context where current-test-case-around is parameterized to test-suite-test-case-around. This has been useful in testing RackUnit. It might be useful for you if you create test cases that create test cases. The require/expose macro allows you to access bindings that a module does not provide. It is useful for testing the private functions of modules. Requires id from module into the current module. It doesn’t matter if the source module provides the bindings or not; require/expose can still get at them. Note that require/expose can be a bit fragile, especially when mixed with compiled code. Use at your own risk! Like dynamic-require, but gets internal bindings like require/expose. The textual UI is in the rackunit/text-ui module. It is run via the run-tests function. The optional verbosity is one of 'quiet, 'normal, or 'verbose. Quiet output displays only the number of successes, failures, and errors. Normal reporting suppresses some extraneous check information (such as the expression). Verbose reports all information. run-tests returns the number of unsuccessful tests. 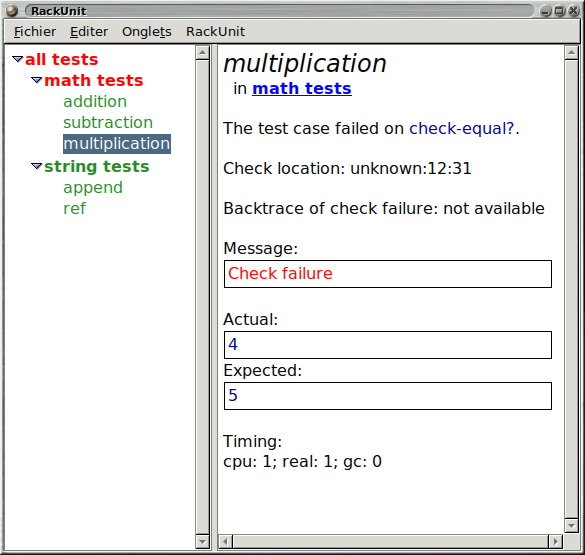 RackUnit also provides a GUI test runner, available from the rackunit/gui module. (test/gui test ... [#:wait? wait?]) → void? Creates a new RackUnit GUI window and runs each test. The GUI is updated as tests complete. When wait? is true, test/gui does not return until the test runner window has been closed. Creates a new RackUnit GUI window and returns a procedure that, when applied, runs the given tests and displays the results in the GUI.